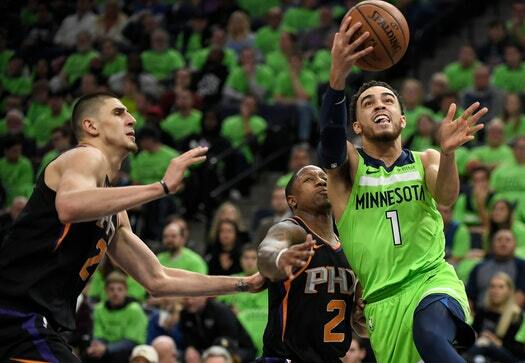 It was an interesting weekend for Wolves guard Tyus Jones. Not necessarily great, but interesting. While he and the Wolves were splitting a two-game road trip, Jones was following both his younger brother, Tre, in the Minnesota high school tournament and watching his former team, Duke, in the NCAA tournament. First Tre Jones helped Apple Valley advance to the state title game, only to lose in the closing seconds to Cretin-Derham Hall. Sunday he watched Duke lose in overtime to Kansas with a Final Four spot on the line. After the Wolves beat the Knicks in New York Saturday, Tyus watched the first half of the Apple Valley-CDH game on the bus on the way to the airport. After that he relied on texts from friends and family to keep up. Sunday wasn’t much easier, with Duke losing. Jones had bets with Wolves teammates Andrew Wiggins and Cole Adlrich – both of whom went to Kansas – and both made sure to give Jones a hard time. Jeff Teague’s younger brother Marquis is a couple days into the 10-day contract he signed with the Memphis after spending the season playing for the Grizzlies’ G League affiliate. With both brothers in the same game, their parents will be in town for tonight’s game. Wolves coach Tom Thibodeau said Derrick Rose – who has missed two games because of a sprained ankle – is getting better. The swelling is down and he’s getting close. But he won’t play tonight. Jimmy Butler, in uniform, was on the court with the Wolves for this morning’s shootaround. But he’s not doing much yet, though he’s feeling better. Thibodeau didn’t bite when asked when Butler might return from knee surgery.